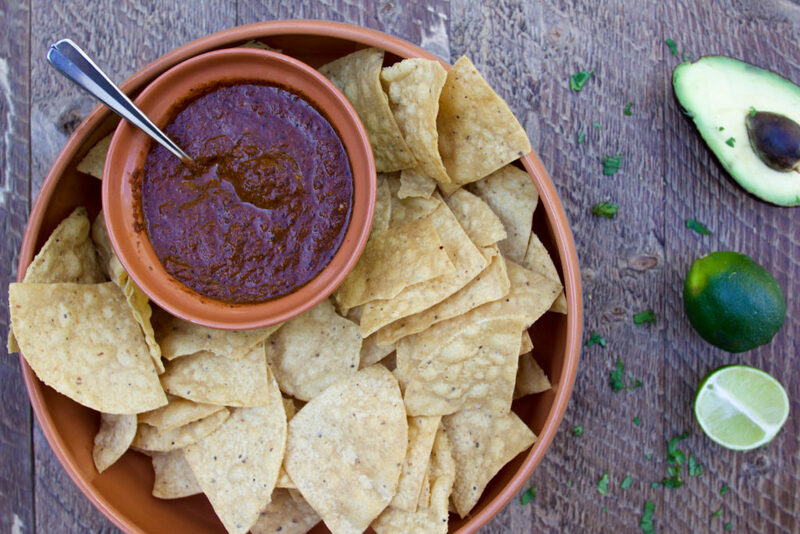 There’s nothin’ like crispy, lightly-salted tortilla chips with some fresh and spicy salsa roja. Am I right? So if you want your salsa roja done right, you have to make it yourself. And luckily, making this mouth-watering homemade Mexican-style salsa roja (red salsa) is fun, easy, and oh-so rewarding. If you’re ready to have a go at this extremely addicting, flavor-packed, and highly delicious salsa roja, then I’m ready to share the recipe with you. Here’s our recipe for the best-ever salsa roja, complete with spicy roasted chiles, fresh flavors of tomato and cilantro, and smoky chipotle peppers. Since my dad dreamt up this recipe years ago, this salsa has become a refrigerator staple at our house. We probably make a new batch of it every two to three weeks. This salsa roja is one of those things that, once you make it, you can’t live without it. Just by the list of ingredients, you can already tell how amazing this salsa is, right? It’s loaded up with tons of bright flavors and spice. Next, you simply throw (most of) the ingredients onto a hot grill pan, and get to roasting! Roasting everything imparts a smoky richness into the salsa, and I know you’re going to go bonkers for it. Then, after all of your ingredients are prepped, charred, and ready to go, all that’s left to do is throw everything into a good blender, and let it whirl until the salsa is smooth! See how simple this recipe is? You will never have an excuse to buy store-bought salsa again. And what’s more, you won’t want it! Okay, guys. Get to it! Run to the store now and fill up a basket with fresh ingredients. Then race back to your kitchen to make this salsa roja, and try — just try — to tell me it’s not the best salsa you’ve ever had. My guess? You won’t be able to. Instead, you’ll be too busy stuffing your face with chips coated in this addicting deliciousness. Oh, yes! Looking for the best Mexican salsa roja recipe? This red salsa is packed with flavors of roasted tomatillos, tomatoes, chipotles, habaneros, guajillos, garlic, and more. This salsa is so delicious, we bet it'll become a refrigerator staple in your home. Heat up a grill pan on the stove over medium heat. Once hot, drizzle with olive oil. Put the tomatillos, tomatoes, arbol chiles, guajillo chiles, habaneros, jalapeño, and onion onto the grill. Roast until everything is browned on all sides -- about 15 minutes. Add the garlic onto the grill for about two minutes, being careful not to burn it. Turn off the grill pan. Separate the guajillos and árboles, and add them to a bowl of hot water. Allow to soak for about 20 minutes, until the chiles are soft. Reserve 3/4 cup of the water from the bowl. Add that water, and all of the ingredients into a blender. Blend until the salsa is a smooth purée. 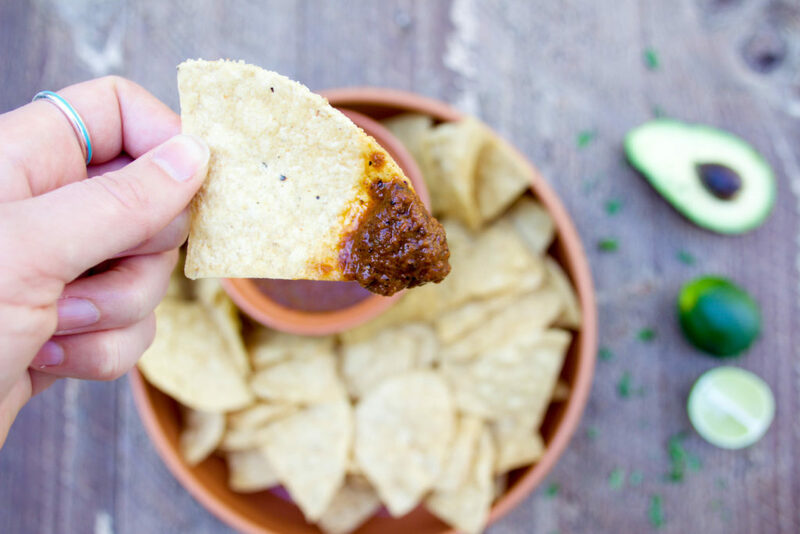 Allow the salsa to cool in the refrigerator, then serve with fresh tortilla chips! Did you make our Mexican red salsa? Let us know in the comments what you thought! If you have any questions about this salsa roja, feel free to leave those below, too.